We have introduced a new attachment markup window in task's conversation sub-tab. If you attach a single file, then the new markup window will display after the file is selected from your computer. If you attach multiple files, then the attachments will appear in the input field and you will have to select each pencil icon to display the markup window. 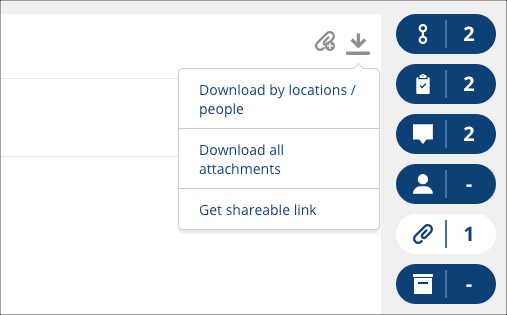 Get shareable link - generates an external shareable link for non-Intelocate users to view and download images from the task. You can view attachments in two different layout - grid view and list view. By default, attachments are displayed in grid view. Tags and description that were provided during the markup process will be displayed on this page. You can filter images by selecting different tags at the top of the page. Column body content is left aligned under the Created By column. We have updated the mobile UI for the conversation sub-tab page. Updated the asset and sub-asset profile icon colour to #8E8E8E. Removed the More icon on the left navigation panel if there are only limited number of modules available. Reapplied the missing X icon to close the Sort and Filter on mobile browser. Fixed a UI bug on the calendar widget. Left aligned column texts under the Created By column. When creating a sub-task, any attachments from the parent-task can be removed from the sub-task creation window. Applied the correct process tracker when adding a new asset in a task.